« When is an iPhone not an iPhone? 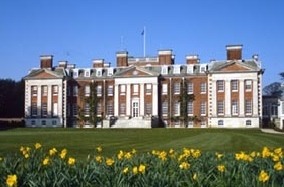 I was invited to give a talk on Ndiyo, CamVine and DisplayLink at IBM Hursley yesterday. It was a first for me – I hadn’t been there before – but it must be a nice spot to work. Just outside a picturesque Hampshire village you turn off the road and go up a long drive through beautiful grounds to the campus. It’s centred around a magnificent 18th-century house, and though this is rather dwarfed now by the extensive modern buildings which are home to the nearly three thousand IBM employees there, it must be very pleasant to stroll through the gardens at lunchtime. And I doubt many other technology campuses have their own cricket pitch. It was also the first time I’ve given a technology talk in a former ballroom! I met some great people and had good discussions. But we stopped short of dancing.